Bisquick Heart Smart® recipe! Trying to eat more fish? 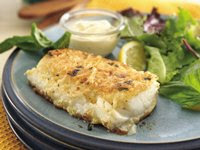 Adding herbs is a tasty way to savor your favorite fillets. Cut fish into 2 serving pieces. In 8-inch skillet, heat oil over medium heat. In small shallow dish, stir together Bisquick® mix, bread crumbs, basil and salt. In another shallow dish, beat egg white. Dip fish into egg white, then coat with Bisquick mixture. Reduce heat to medium-low. Cook fish in oil 8 to 10 minutes, turning once, until fish flakes easily with fork and is brown on both sides. Calories 250 (Calories from Fat 90); Total Fat 9g (Saturated Fat 1 1/2g, Trans Fat 0g); Cholesterol 60mg; Sodium 530mg; Total Carbohydrate 15g (Dietary Fiber 0g, Sugars 1g); Protein 25g. Daily Values: Vitamin A 0%; Vitamin C 0%; Calcium 8%; Iron 8%. Exchanges: 1 Starch; 0 Other Carbohydrate; 0 Vegetable; 3 Very Lean Meat; 1 1/2 Fat. Carbohydrate Choices: 1. This entry was posted on 6:58 AM and is filed under Fish and Seafood . You can follow any responses to this entry through the RSS 2.0 feed. You can leave a response, or trackback from your own site.